I have just started the Beginners Running Program 3. I'm taking an exercise class at my local college in addition to the running program. The days between my running days (M-W-F), I am doing a program that includes 45 minutes on an elliptical cross-trainer and a series of weight training exercises (T-Th-S). Do you think these two training regimens are in conflict with each other? 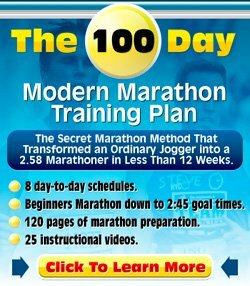 Thanks for your question about cross-training and your beginners running program. In principle, I don't think there is anything wrong with the approach you are taking. It is great to see you are exercising 6 days a week, which is more than I'd say 99% of the population is doing! You just need to make sure that you are not overdoing it. When you find yourself getting worn out / tired due to your exercise regime or when you are experiencing pains you normally don't have, then I'd suggest you take a rest day. As long as you do your runs at an easy pace and you don't go absolutely crazy on the elliptical, but also just work aerobically, I'd say that you have got a good thing going! It's only when you'd get into more advanced running training that the amount of cross-training you do can get in the way. E.g if you were to start training for a (half) marathon or when you want to really focus on a big race and you run 5-13 times a week. As long as your cross-training does not stop you from doing your runs and it does not tire you out so much that you can't do your runs properly, I'd say just keep it up and good luck! I am on my 4th week of the program and now the running time is more than the walking time. I am a bit on the heavy side so I am thinking that I put lots of pressure on my knees cause I felt a bit of pain on one side of my leg. Is it ok to take 2 days rest? What do you suggest for a guy who is a bit overweight? I have good shoes and I do go at a very slow pace. When you are in pain I would definitely advise to get a bit of rest. The pain on one side of your leg could be something like iliotibial band syndrome. Feel free to make adjustments to your running program geared towards your needs. So, just add more walking breaks. It is okay if your running program does not take 12 weeks, but, say, 15 weeks or longer. As long as you run a number of times per week and work towards that goal of a healthier, fitter you!